I keep promising, idly, not to become an opera queen. The contemporary stagings of the operatic repertory of femme fatale at the main houses in Berlin, however, are not helping. Compared to the youtube clips of the famous divas playing the role, Morenike Fadoyomi as a singer was hardly exceptional. But in this case, too great an emphasis on the virtuosic soprano’s voice distracts, from the pathos and perversity of what is after all a form of theatre. Her acting was fierce. 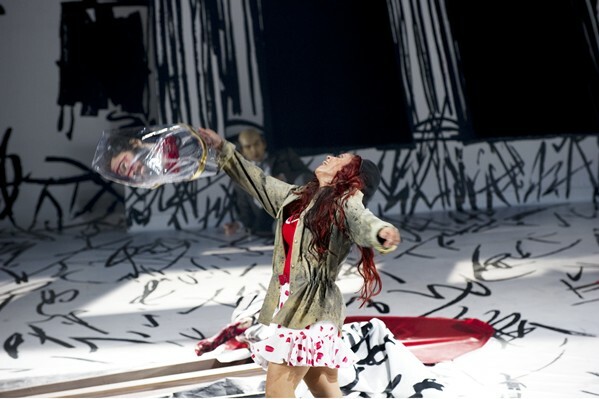 That is where the Komische Oper version stands out to an opera newcomer like me. It is not just that Salome starts out looking like Rihanna, and ends resembling both Janet Jackson and Madonna, circa American Life. It is that these pop references (made in the staging and costume design, by the way, not the singing, which as far as I can tell is traditionally done) keep Oscar Wilde’s play and Richard Strauss’ music fresh and relevant. Some of the updating felt like a stretch, an overreaching attempt to propose the opera as an allegory for contemporary conflict in the Middle East. This was confusing in part because the play itself is imagistic and symbolist. Ironically, adding layers of allegory to such image and symbols had the effect of making them more, not less, realist, narrowing their range of meaning. But overall, I confess I approve setting play in a militarized anyplace of the present (Gaza? Guantanamo? Syntagma Square?). One could almost apply a Hardt and Negri reading of this staging (although more likely the German intellectuals behind the production have already read their Hardt and Negri) and its updating of Empire as everywhere and nowhere. The contemporary Roman empire is and is not the US, Herod is and is not Dominique Strauss-Kahn or Silvio Berlusconi, a postmodern tetrarch betrayed by his own lust for power and nubile flesh. Under this description, our identification with Salome surpasses the femme fatale’s customary idolization by the gay male gaze. She becomes the Joan of Arc of the contemporary multitude, the pervert-saint who founds our new military religion, which is perhaps why this production ends with her standing in iconic defiance, dressed in military fatigues and a Che beret, rather than crushed under the blows of Herod’s soldiers.